In 2017, the Broward MPO is celebrating its 40th Anniversary! Since its creation in 1977, the Broward MPO has worked to move people, create jobs, and strenghthen communities in Broward County. 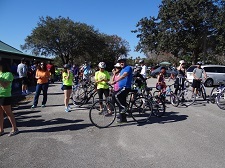 The fourth annual Let's Go Biking event will be held on Sunday, March 19th at the Pompano Community Park in Pompano Beach. The Broward MPO has partnered with the Broward County School Board to promote safe walking and biking, so that school children have safe paths on which to get to and from school. Through the Safe Routes to School program, the MPO works with the School Board, among other partners, to fund walking and biking paths that allow for safe passage for kids walking and biking to school. Students from Deerfield Beach High School gathered at the Broward MPO office on Wednesday, December 7 for a "Think Like a Planner" Workshop, where students walked the Cypress Creek area and determined how to make the area more accomodating for pedestrians, cyclists, transit users, and motorists. Students came to the MPO as part of the Career, Technical, Adult, and Community Education (CTACE) program. Read more: Deerfield Beach H.S. 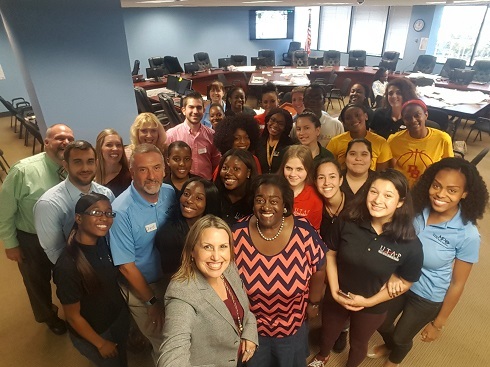 Students "Think Like a Planner"
The Grantsmanship Center will host a week long "Competing for Federal Grants" Training at the Broward MPO office from February 27-March 3. Participants must commit to a week long training session. The Broward MPO, in partnership with the City of Oakland Park and Brightline, broke ground on construction of a Quiet Zone on the Florida East Coast (FEC) Railway tracks in Broward County on November 14th. The event was held at NE 38th Street in Oakland Park, in front of the Funky Buddha Brewery.